A classic piece of magic and mystery, the Milk Magazine is a 'must have' for any general magic performer. This refill gimmick by Uday Jadugar is perfect to fit into any magazine or newspaper and is made to the highest standards. For those unaware of the effect, you display a magazine or newspaper and begin fold it. 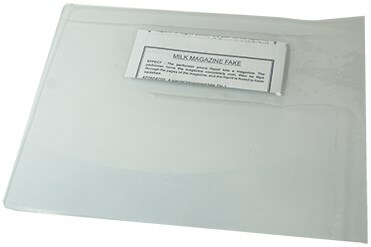 You then proceed to pour liquid into the magazine (usually water or milk), yet when you turn the magazine or newspaper over the liquid doesn't spill out! You can even open it up and flip through the pages and the liquid vanishes completely! Package includes gimmick and magazine.